The Genealogy Center has state of the art equipment for viewing microfilm and microfiche. Please bring a flash/USB drive with you to save your images. The Catholic Church in New Mexico kept meticulous records for baptisms, marriages and burials beginning in the late 1600s. Many of these records still survive and are available at the Genealogy Center on microfilm. The Genealogy Center has these archival records available on microfilm. The guides below will help you to determine which rolls of film will be pertinent to your research. Spanish Archives series I are records related to Spanish land grants. Series II are other types of records. 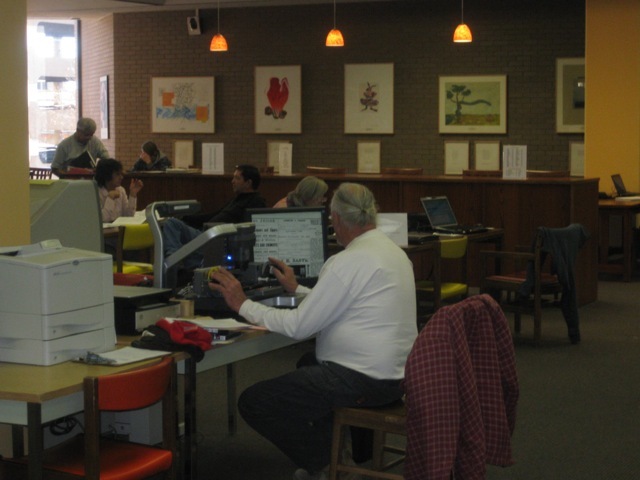 Summary of records from New Mexico counties available on microfilm at the Genealogy Center, including tax assessment rolls, probate, property/deeds, and mining records. NM death certificates available on microfilm and on the local area network at the Genealogy Center. Summary of City Directories from New Mexico cities and town available on microfilm at the ABC Library Genealogy Center. More Catholic Church Microfilm Now Available! The Genealogy Center has all available microfilmed records for Catholic churches in over 130 New Mexico and southern Colorado communities. See the file for Catholic Church microfilm at the Genealogy Center to the left for more detailed information and visit the New Mexico Genealogical Society website and look under the E-Research tab for a list of available records by County and community. Many New Mexico church records have now been digitized and can be viewed on FamilySearch.org after creating a free account. We can provide assistance with using FamilySearch.